Mary Green compares the wildlife of Scotland, Africa and home. It has been an interesting summer so far for wildlife. Alternating warm and cold weather and plenty of rain led to some good growing conditions and long flowering for some plants. However, some of the birds struggled with their young in the cold late spring. I have not seen as many goslings as usual, though there are cygnets and plenty of ducklings and moorhen chicks. Some early-flowering fruit trees haven’t set well, presumably caught by frost. I was pleased to see common blue butterflies (not so common!) on the flowers around the station area in Alvechurch, which are doing well this year. There is good insect life at the Lime Kilns site at Tardebigge, including a stunning scarlet tiger moth. The bee orchids managed to make it out at Bittell despite being mown down in May, along with the other plants on that patch. But the spotted orchids and centaury didn’t come back to Sandhills, as those verges were mown in June. It was good to see some of the gardens in the Alvechurch Open Gardens scheme and the Barnt Green Open Gardens giving space to wild plants. One in Alvechurch had wild plants with fruit trees and bushes, making a great wildlife haven. In Barnt Green there was an otherwise close-mown lawn with patches of long grass hosting orchids and other wildflowers. Another good complementary planting is wild flowers with old-fashioned garden plants, some of which are very similar to our natives: I saw this in both gardens. Plants like astrantia, bistort and the garden geraniums fit in well and are great for bees. I spent a week in June in Southern Scotland, on the Solway Firth. We had pleasant warm dry weather while the Midlands were having deluges! The wildlife was lovely there. 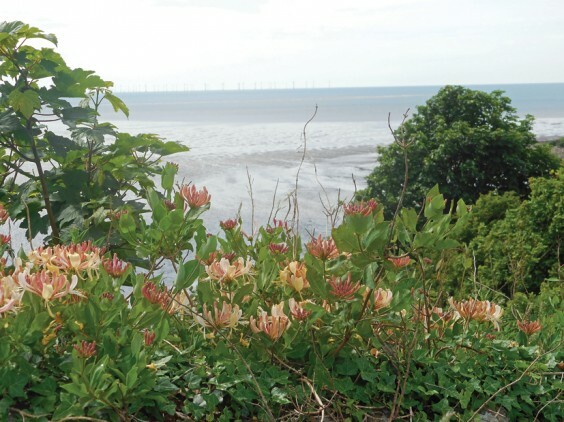 The cliff edges are steep enough to have been left uncultivated, and they are covered with wildflowers. Some of these are the flowers we get in old meadows, some similar to them, and some very different. In wetter places are flowers like we get by the canal, but also some we don’t see. The abundance of flowers meant it was a great place for butterflies, moths and bees. The flowers on the cliffs came in waves. On one stretch there were northern orchids, rock-roses and sheeps-bit scabious, then there would be bloody cranesbill, thyme and burnet roses (none of which grow round here). Burnet roses are lovely low-growing roses with small white flowers which grow in cliffs and sand dunes and even on the beach. They have amazing black rosehips in autumn. Bloody cranesbill is a relative of the blue meadow cranesbill and pink herb-Robert that we get, but has stunning deep crimson flowers. Flowers like pennywort and sea-campion nearby reminded me of Devon. Then we would find lady’s bedstraw and agrimony, both of which grow in Scarfield Dingle. Any wet land was full of hemlock water dropwort and yellow flag iris, just like our canal but more so, and then huge patches of ragged robin, which is rapidly disappearing round here. Galloway is famous for broom, a striking shrub with bright yellow flowers, which grew everywhere. I have also never seen so many foxgloves! Everywhere was very scented. Honeysuckle (above) was so abundant – all over the hedges and cascading down the cliffs. It’s an early type of honeysuckle, very yellow. There was also a scent of elderflower everywhere. Elder is very common and is rather surprisingly in the same family as honeysuckle. There was a promise of some good flavours later: lots of gooseberries and raspberries growing wild in the hedges, not ripe when we were there, but full of fruit. There are many small lochs (ponds or lakes) in the area. These mostly have white water-lilies, not the native yellow one we have here. On the margins, they have some very impressive wild plants we don’t have: marsh cinquefoil and greater spearwort. The former is related to the little yellow cinquefoil (with its five-segmented leaves) we have, but is big and crimson. The latter is a relative of the buttercup. We get lesser spearwort near here, but the greater one is like a super-buttercup, growing with its feet in the water. They also have valerian, which does not occur here in the wild. On the dunes and saltmarsh by the Solway, and the miles of sand, there are several bird reserves. In winter these would be wonderful places to see bird visitors, and are one of the key sites for barnacle geese. At this time of year they are quieter, but it was lovely to see and hear curlews and oystercatchers. Best for me was walking through the saltmarsh surrounded by skylarks, rising all around and singing their hearts out. It’s a long time since I’ve heard so many of them. Every night we watched badgers from where we were staying. Their habits are interesting: they patrol their patch at the same time each night looking for food. One year we had some here in Withybed and they had the same kind of regular movements. We also saw nesting ospreys, and red kites. Dumfries and Galloway is an odd area. It was a favourite spot for the Victorians to holiday, and there are what used to be very prosperous little seaside resorts. Trade and fishing were important and there are many old harbours, most of them little used now. Many of the beaches are full of cockle-shells instead of sand, and cockling is still practised. The hills were heavily forested for timber, but this became a less important crop, and has now been threatened by a disease of larch trees. Swathes of the forest have been cleared now, which will probably be an improvement for wildlife. Conifer plantations are good for a few species of birds, but inimical to other plants and their accompanying insects and birds. This area has always been and still is a big cattle-farming one, known for the Belted Galloway cattle. One the hillier areas there are sheep too. These grazed fields are one of the reasons for good biodiversity in wildlife: there is not much arable land. Like many such areas, it has been rescued to some extent by tourism and associated environmental protection. Some of the small towns are good local high street shopping centres or centres for arts and crafts. But it looks like a difficult place for young people. Earlier in the year I went further afield and visited Mozambique and Swaziland in Africa. It always strikes me when I go to really different places that many of their wild plants are our garden flowers or house-plants. I also notice that their common wild flowers (i.e. weeds) are quite similar to ours. They had been suffering from dry weather during their usual wet season, so the plants weren’t as abundant as they should have been. But it was still fascinating. Some of the flowering trees are stunning: flame trees, flamboyants and the amazing pink silk-cotton trees. I was fascinated to see a tree with its exposed roots covered in tradescantia, that silvery-striped pot plant we all used to have! And of course exotic flowers like proteas, which we saw there, are a favourite in gardens in mild places here like the Scilly Isles. Morning glory is a beautiful flower, but is only a blue version of the white convolvulus everyone tries to weed out of their gardens in the summer. It’s a mixture of familiar and unfamiliar when you travel. I’m always surprised to find bracken growing in Southern Africa just as it does in our hedges here and on open moorland and cliffs. And at Christmas I will remember the poinsettia trees, which all those gift pot plants would like to be! Unless you go to a reserve you don’t actually see much animal wildlife in Africa. We did see squirrels, and found quills left behind by a porcupine. However, you do see and hear birds. We saw kingfishers, some brown ones and some the stunning blue malachite kingfishers. There were peacocks, hoopoes, herons, bee-eaters and bulbuls and many more. There were also wonderful butterflies – many of them much bigger than ours. I saw a lovely Oleander hawk moth, common there but a rare visitor here, and two butterflies a bit like swallowtails mating. Just as here, they fly in the sun, and so you get more chance to see them there. I’m off to the isle of Islay next, which will be very short of trees but I hope will have lovely wild flowers, and should give me plenty of chance to see seashore life. My poem is from a significant birthday I celebrated here in Withybed this year. The title is a quotation from Piers Plowman, a medieval poem also set in Worcestershire. And all parts are woven into the music. We are knee deep in buttercups, sunlit. Than all the florists’ bouquets. With this sun, among these buttercups.